So, the event is the biggest part, right?. But lighting is so vital too. We’ve all seen the Pinterest boards with amazing light wrapped around a beautiful couple. But what about the composition? I know, I know. As a wedding photographer I am always chasing the perfect composition. Give me great love, wrapped in great light, epic setting and gorgeous couple and I can make magic. So that’s about it to creating priceless photos. Maybe. Great love + great light + epic setting + gorgeous couple = Priceless moment. Here’s where I blow your mind. Ready? All that stuff I wrote is important for great photos, but the key to making a photo priceless is printing it. Yep, print it. Don’t believe me? Print any photo you have of you & a loved one. Now put it on your refrigerator with a couple goofy magnets. Let that photo live in your daily life. Let it witness countless meals, parties, gatherings, grocery unpackings, midnight snacks, and all the other kitchen moments. Fast-forward a few years. Clean off your fridge and throw out expired coupons, written reminders, receipts and recipes. Bet you’ll not part with the printed photograph. I am not sure why this phenomenon occurs. But it is real. And it’s a universal law. Print a photo and it becomes priceless. It’s that simple. Something about it living in our world & not in our phones or tablets gives it “priceless” status. What’s more, it may not even be our favorite or the best photo, but when it’s printed, it’s priceless. 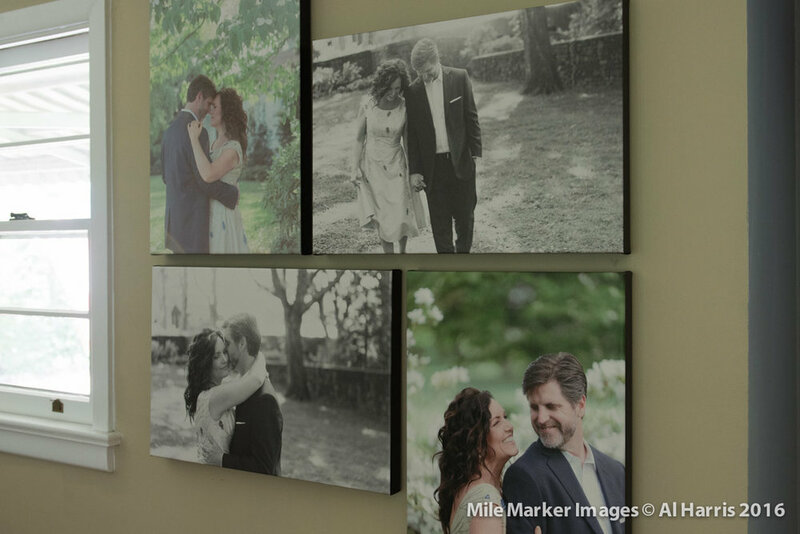 My wedding photos on archival canvas in my house - these mean everything to me. So what’s all this have to do with being a wedding photographer? Glad you asked. I believe in printed photos so much that I work hard to help every couple get prints, a canvas or an archival wedding album. Imagine a canvas of you, on your wedding day, with your spouse. This canvas hangs in your home for all visitors to see. It tells them, that moment & that person are everything. The canvas reminds both of you of the vows you made. The photo becomes a part of your daily life. Your kids will look up at it – and occasionally poke fun of your hairstyle or make up. But when you’re gone, your kids will fight over it. And it’s the same with your wedding album. Put it out in a place where guests can see it. They don’t need a password to operate it. Young kids and old folks a like love flipping through images. Something happens between our hands, arm, shoulder, eyes and brain when we look at printed images. Digital has never quite got that part figured out. Classic, timeless, & no battery required. We use only the highest standards of printing & binding. Sample of our wedding albums - leather, archival paper, and all lay flat pages. Most of all, when you miss your mate, you can grab your wedding album and revisit a million memories. Each photo spurs more than what is in the image. That’s the power of photos but it’s exponential for printed photos. And on those occasional nights when you loose power, light a candle, get romantic and sit with your mate. Walk through your wedding day together – slowly. Share & giggle & remember why you said those vows. And be very thankful you chose to have a wedding album. I bet they look at these images & remember so much. As I pointed out, we work hard to insure each couple get prints of their wedding. You may ask, “What is it you actually do to insure I get prints?” Glad you asked. All our packages come with studio credits. This is a way for you to purchase prints, canvas or album after the wedding without spending more money. We build it into the package price. When you choose us you can rest easy knowing there is an option included for you to finish the process with an archival quality, lay-flat, leather bound, artistically crafted “priceless” wedding album. 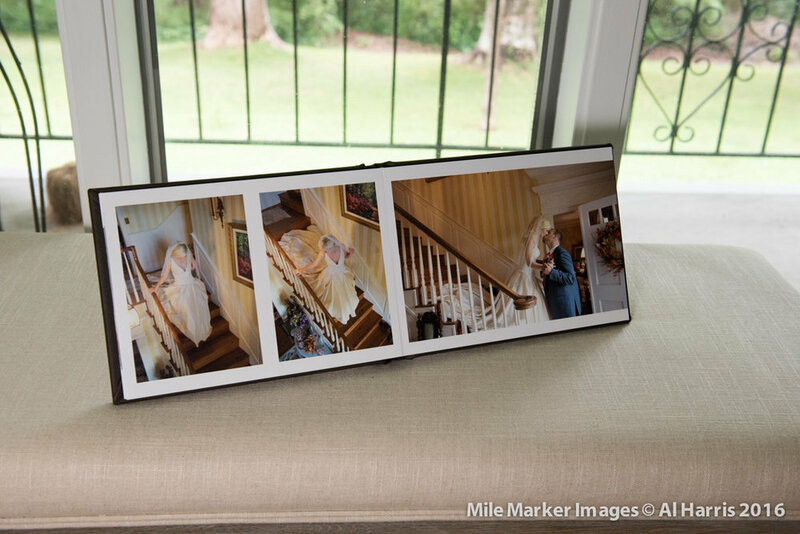 We also have parent and grandparent albums that are smaller versions of your wedding album with fewer images. Ask your parents and grandparents how priceless printed photos are. Then you’ll really understand why we want you to have printed memories of your wedding. Our wedding album for the couple, with smaller size for parents or grandparents. When you are ready to choose a wedding photographer, we’d love to help you create priceless photos!